Hair is the symbol of beauty and health. In today’s modern era, a number of people are suffering from hair loss. Because of this, at the younger age itself people are losing their self-confidence and lagging behind in their studies. 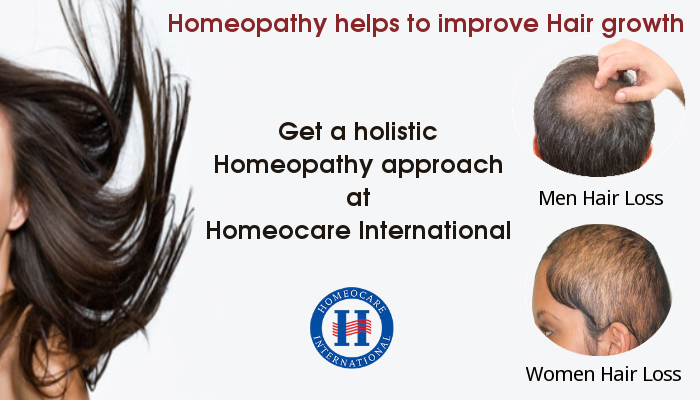 There exists a valuable solution for hair in homeopathy treatment. On our head, there exists more than 1,50,000 of hair. A hair follicle is a part of the skin, from which hair production starts. From each Spindle, throughout the life nearly 20 to 30 hair will be produced. The life span of hair is nearly 3 to 5 years. Hair spindle starts from the second layer of skin known as dermis. Each and every hair, forms with three layers, which are entitled as modules, cortex, cuticle. The more your cortex is stronger, the more your hair will be strong. In this cortex only, there exists a pigment called as melanin. The amount of melanin in your hair determines your hair color. If your hair is black, then it means your body produces more melanin. If melanin amount is less or reduced, then your hair turns into white color. The growth of long hair starts from the hair spindles. This is the initial stage of hair growth. During this stage excessive hair growth will be seen. The duration of this stage is 2 to 6 years. During this second stage hair growth will be stopped. Duration period is 2 to 3 weeks. In some men, an excessive hair loss is seen. Due to this forehead part on the face goes on increasing towards backward direction. The main reasons behind the hair loss in men is inheritance, Dihydrotestosterone (DHT) hormone, mental stress, dandruff, concern, psoriasis in head, smoking, typhoid, thyroid and hair dying. Mainly in women, after the head bath when they comb the hair, due to tangled hair they experience an excessive hair loss. Gradually it increases and results in thin hair or may even to baldness. In women, hair loss problem is seen due to hormone problems, thyroid problems, PCOD, mensuration problems, Anemia, intake of few medicines after delivery time, mental stress and other concerns. In some individuals, either on head, or mustache, beard hair loss is seen in circular way. For this mental stress, body defense system attacks own hair and causes major effect on spindles. In some individual’s all head hair loss is seen (even eyebrows). The main cause of this is not known precisely, but mental stress and auto immunity may be the cause of this disease. With the help of CBP, TSH and hormone tests the causes of hair loss can be recognized. At Homeocare International, using genetic constitutional treatment method, the main cause of hair loss can be identified and patient’s mental and physical conditions are taken into consideration to provide the treatment, and correct the hormones mismatch, which lead to the cause of male pattern baldness in male and the cause of female pattern baldness in female. Additionally, patient’s immune system gets corrected, which lead to the cause of alopecia Areata & alopecia totoalis. The Homeocare Treatment method not only strengthens the hair follicles and controls the hair loss but also results in growth of hair in 80% of individuals. ← How to Reduce Asthma through Homeopathic Treatment?